Do you worry that you'll not be able to improve your rank in school? Don't! In this post, Martina gives her HSC study hacks for how she jumped from 48th to 1st! In this post, St George Girl’s High School Graduate and Matrix Alumnus shares her secrets for how she went from being ranked 48th to 1st in Chemistry! My name is Martina Ta and I recently graduated from St George Girls High School. I will be studying a Bachelor of Oral Health at The University of Sydney. The subjects I performed the best in were Chemistry and Modern History. A large reason for this derives from my inherent passion and interest for both of these subjects. By doing subjects which I was already passionate about I was naturally compelled to be driven and focus on them. Additionally, with Chemistry I was blessed with experienced teachers at Matrix who strengthened my exam technique and really harnessed and solidified my knowledge! This allowed me to easily apply the knowledge I’d learned in my school exams. Hence, in classes at school it was a matter cementing and amending my understanding. With Chemistry, one of the most important factors for me was having a strong fundamental understanding, rather than merely rote learning the content. There is definitely too much content in the Chemistry syllabus to be rote learning it all!!!! The subject I performed the worst in was Maths Ext 1, in contrast to Chemistry and Modern History it was my least favourite subject. Maths Ext 1 requires a significant amount of practise and patience! Time management is crucial during your HSC year. Over Years 11 and 12 , I developed a system that was most suitable for me and I worked with best. It is really important to be able to treat your Preliminary Year as a trial year, that means being versatile and experimental so that you have a system that totally works for your when Year 12 rolls around. I had a very flexible rhythm coming into the HSC, rather than have a timetable with set time allocations and slots, (i.e. 4:30pm – 6:30pm complete all school homework) my “schedule” was made up of priorities which I would have to complete that evening. Until I had completed the two or three priorities which were listed on my “schedule” I would not go to bed! Such a flexible system meant that if for some reason there was an interruption during the week (which is bound to happen!) there is no excuse for not being able to complete everything you have set out to do. BE AS SPECIFIC AS YOU CAN WHEN ESTABLISHING YOUR SCHEDULE! That way as soon as I sat down to work I was not tossing over what part of “Chemistry” I had to complete that evening, it was a matter of just getting it done. For me, this schedule or “list of priorities” would be revamped at the end of each term or even right after assessment blocks. Year 12 is a long and arduous year, for me one of the most significant problems was being able to maintain my motivation. Having an ATAR goal gave me a vague trajectory to follow but being able to get to that destination was difficult. Below are some of the tips and lessons I gained along the way which grounded me and kept me on track through such a long, and at-time tedious year. Past papers are your friends! It is important not to undermine the value of past papers. If I was doing it again and I were approaching exams and hadn’t finished homework yet, I would disregard my homework and complete as many past papers as possible instead. Past papers give you an opportunity to refine your exam skills! From my experience especially with Chemistry and Biology exams, one of the most crucial factors to success was correctly analysing the exam questions (such as noting what verbs are in the question) and being able to convey your content and understanding in a concise manner. For me, the best way to master this was by doing as many past paper questions as possible. A testament to this approach was the Matrix Chemistry Homework booklet, where most of the “homework” questions were exam style questions or past HSC questions. Leading up to exams I would redo Matrix Theorybook questions again and again, alternating with HSC past paper questions. Over time, as you practise with past papers, you may find some questions to be a chore because of the repetition! Ironically, this is exactly what I sought out, as I knew that in the exam I could emulate this and simply write out my answer without thinking. NESA provides a copy of the syllabus of each subject online. When learning a topic in Chemistry and Biology, my Matrix teacher would always break down the dot point before we proceeded with the content. The syllabus is NESA’s way of dropping as many hints as possible! Exam questions will cover several dot points, and by knowing what the syllabus dot point asks for you can nail all the points the markers want you to engage with based on the syllabus. For Chemistry and Biology, there is a huge emphasis on the key words of verbs used in the question. This not only directs you to how much detail you should include in your question but how you can answer the question most effectively. I had this table from Matrix stuck on my desk wall and would refer to it each time I forgot the definition of a verb. Before answering each question, I would always underline or highlight the key verb. For some of my content heavy subjects, including Modern History, my “notes” were up to 30 pages a topic. Having said that, it is important to remember that your notes are just detailed pages of information! Hence, it is your “knowledge”. However, when it comes to studying, reading “notes” again and again is not the way to do it. 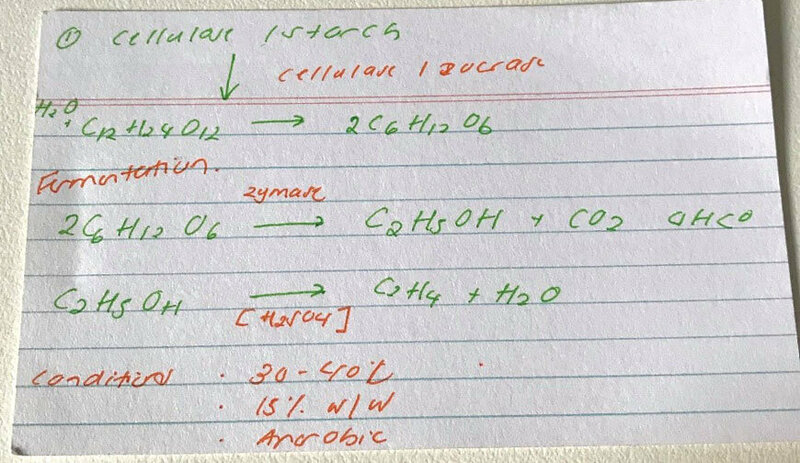 Because I attended the Chemistry and Biology courses at Matrix my “notes” were generally in the Matrix Theorybook provided in class. 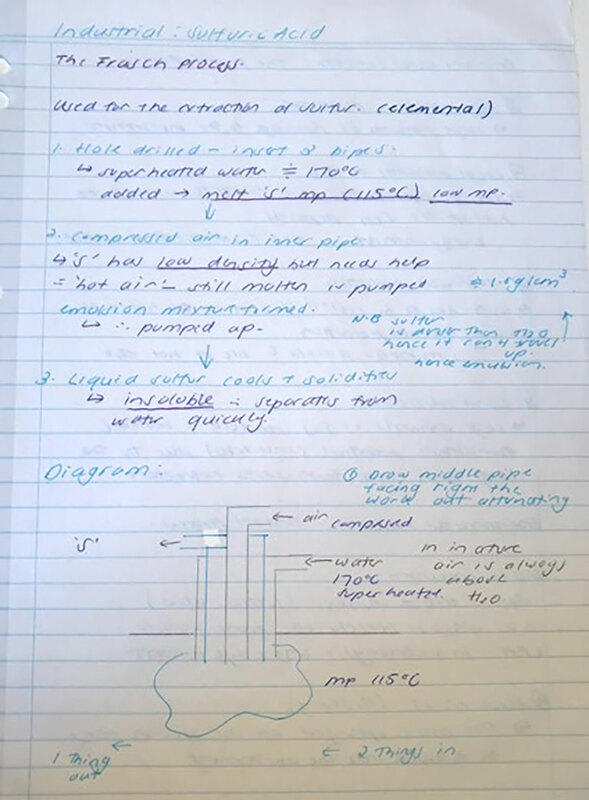 For particular topics which I struggled with a little more, I would write condensed summaries that I’d refer to before an exam or whilst I was practising past paper questions. Alternatively, I would draw out mind-maps/ flowcharts on particular topics. 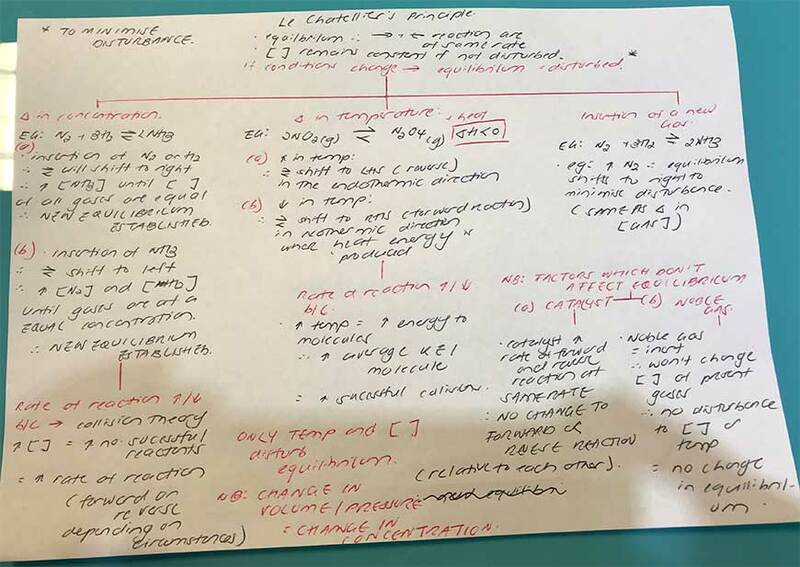 For more methodical subjects – such as Chemistry and Biology – these mind maps facilitated the methodical and concise way I answered exam questions. This was extremely useful for these subjects, as exams are generally based upon applications of your understanding rather than how well you have memorised the content. So, when answering questions, I would visualise these flow charts, constructing my answer accordingly. The HSC has so much content, and to try and study purely off your notes means you are not compartmentalising the information and understanding it to apply it correctly and effectively. The HSC is a lot of content, do not rote learn content! The HSC requires you to learn a lot of content, especially if your subjects are a combination of extremely content heavy subjects. Keeping this in mind is crucial to being able to “study smart, rather than hard”. “Study smart not hard” is an especially important mantra for Chemistry and Biology. There is a stigma that these subjects can be overwhelming with content and information. So, for some studying “hard” would translate to simply trying to memorise all of your content. To avoid this when learning the topics for the first time, at Matrix I would endeavour to completely understand each detail of what I was learning. As I used this approach to fill any holes in my understanding, Chemistry and Biology became significantly easier. Because of this, when sitting an exam, I would never have any “mental blanks” on how to answer the questions. Instead, answering exam questions became a neat progression of laying out my understanding. Everything in science is cause and effect, this is what makes it so simple. On the few occasions where I had to memorise bits of information, I would always have little mnemonic tricks that encouraged me to memorise it more easily. For example, in Chemistry the ester name I memorise was ‘pentyl pentanoate” which was the ester for the apple scent. Each containing two p’s. Alternatively, if something would not stick in my head I would write flashcards and continually recite what was on the back of the flashcards. Flashcards, I found, were highly effective in a similar manner to doing past papers because you are physically testing your self as you recite through your flashcards. The HSC year is a long year and, so, maintaining your motivation is difficult. Taking up my extracurricular activities gave me room to breathe and an opportunity to clear my mind and even learn new things outside of the classroom. This doesn’t mean not prioritising your HSC, though! I have always been extensively involved things like Duke of Ed, orchestra, and in Year 12 I was School Vice-captain, swimming. Throughout Year 12 I wanted to keep these outlets, and to mitigate the problem of juggling I simply reduced the frequency of the activities. For instance, rather than attending three sessions a week of swimming I would attend just an hour a week. Not only do extracurricular activities give you a break from the strain of the HSC, at the end of the day when you’ve completed your HSC it is these activities which will make an impression in your memory. Maximise the help you have around you! I cannot stress this enough: all your teachers and tutors are there to help you! The best way to maximise your marks and improve is to be able to understand what is missing or preventing your essay from scoring 20/20 rather than 18/20. The people who understand this the most are the teachers who will be marking your assessments at the end of the term. My improvements in English came from actively seeking help from my teacher — sending in physical copies or scanned copies of small things such as numerous reading tasks or my large essays to continually be refined. With Matrix I maximised my help by approaching my teachers with many questions or booking many workshops with tutors! When I did not have specific queries with topics, I would arrange Matrix workshops so I could share my past paper answers on my weaker topics and ask for advice and learn ways to improve my answers in future. Best of luck with your HSC journey! Remember, you have one year to give it your best shot. I have survived it and made it out to tell you there are multitude of opportunities beyond this year! To say that my HSC journey was smooth would be a lie! But the patience and perseverance and hard work you put in now will certainly will pay off!!! I hope that my tips and lessons facilitate a smother Year 12 journey for you! Want to Ace Chemistry like Martina? Book your free Matrix Lesson today. Join over 4500 students who already have a head start like Martina did. Book your free trial lesson today.